Turkey has vetoed Nato's co-operation with Austria, a move which had blocked the alliance's partnership activities with 41 countries. As a result, Nato members recently agreed to change its procedures, allowing partnerships to go ahead on a country-by-country basis. Austria is not in Nato, but co-operates closely with it and has more than 400 troops serving in Kosovo. Turkey is angry with Austria for trying to block its bid to join the EU. It has the second-largest military in Nato, after the United States. Austria has condemned the Turkish action, calling it "irresponsible". A well-informed source told the BBC that heightened tensions between Turkey and Austria had essentially blocked Nato co-operation with the government in Vienna for the past year. The veto originally affected all the Western alliance's partnership activities, which include several ex-Soviet states. But a Nato official, who asked not to be named, later said that the 28 Nato nations had agreed on Monday to change the system to work around the diplomatic spat. "This will substantially reduce the risk of blockages to cooperation with partners across the board," the official said. The procedural reform was already planned before Turkey's blocking manoeuvre, and was pushed through in time to allow co-operation with other countries to continue. But Turkey is expected to maintain its veto on Austria's involvement in operations. A Nato meeting is planned for Thursday, at the 28-nation alliance's Brussels headquarters. Officials said the main topics would be the fight against terrorism, and fairer burden-sharing. US President Donald Trump has criticised Nato members who fail to spend at least 2% of their GDP on defence. Besides the US and UK only Poland, Greece and Estonia currently meet that target. In a statement sent to the BBC, Austria's Defence Minister Hans Peter Doskozil lambasted Turkey for its veto. "I strongly condemn Turkey's course of action in Nato. It is irresponsible behaviour against Austria and strengthens my position that Turkey is very far from being part of the EU," he said. "In this, Turkey is endangering the security interests of Europe. 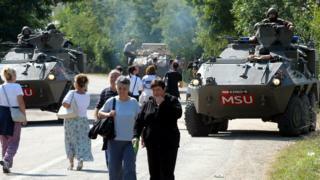 The blockade has a long-term impact on the peace missions in the Western Balkans." Turkish President Recep Tayyip Erdogan has blamed Austria for frosty relations with the EU, amid tensions over illegal immigration via Turkey and his huge crackdown on political opponents. Why has Erdogan riled Nato allies? Austria is one of the main contributors to the Kosovo security mission. A Nato official said the alliance was "not ending its co-operation with Austria". "We greatly appreciate its valuable contributions to our shared security. We hope the bilateral issues between Austria and Turkey will be solved as quickly as possible," he told the BBC. Mr Erdogan has not only lashed out at Austria. His anger at Germany has prompted Berlin to reconsider its air force deployment at Turkey's Incirlik airbase. He was enraged when Austria, Germany and the Netherlands barred Turkish ministers from campaigning on their soil in the run-up to last month's referendum, in which he narrowly won a mandate for sweeping new powers. Austrian Chancellor Christian Kern has spoken out against President Erdogan's purge of public servants suspected of backing last July's failed coup. He said the EU should respond by halting talks on Turkey joining.